In practice, though, many powerful forces determine our food choices. Our children have tasted artificially flavored, partially hydrogenated, day-glow snack foods and clamor for more. Our kids tell us that their friends’ “parents let them eat” the latest processed food fashion. Huge sums of money pay for artists, musicians, toy manufacturers, psychologists, and marketers to work together to carefully manipulate your child’s food preferences. We’re busy and want something simple, quick, and preferably inexpensive. We return to the ruts of the unhealthy foods we ate ourselves as kids or that we know our own kids will like. We feel guilty because of our busy lifestyles and don’t want to say “no” to our kids – especially if it means yet another battle. Phew! What’s a parent to do? Thankfully, making healthier food choices is simple and clear. Increasing fruits, vegetables, and whole grains in the diet makes the diet healthier. Especially in our antibiotic-flooded age, eating foods that contain live active cultures of beneficial bacteria makes our diet healthier. Decreasing artificial chemicals in the diet and the environment makes us all healthier. Nutrition is not an all-or-none activity. The goal is to keep making choices that make the diet a little better. A Stitch in Time The health risks posed by chemicals commonly used in farming may go undetected for many years. For example, DDT used in farming in the United States before 1966 may have caused an epidemic of premature births that has only now been detected! According to a fascinating study published in the July 14, 2001 issue of The Lancet, scientists who studied stored cord blood samples from mothers who had delivered at that time found elevated levels of DDT breakdown products among the group who had premature deliveries or low birth weight infants. This would make DDT responsible for a host of medical problems and the deaths of many children – but the link wasn’t proven until more than 30 years later! DDT use in the United States was stopped in 1972 because it caused reproductive damage to birds (the bald eagle and brown pelican were nearly extinct), but DDT is still widely used in developing countries for insect control. I’m certain that the dangers of some chemicals in common use in the United States today will be proven in the future. I believe that toxic chemicals are one of the biggest health threats to our children. We may not prove the links until they are grown, but we must not wait until then to provide them with safe food, water, air, homes, and schools. On a personal note, my wife has now recovered from a very malignant form of breast cancer. She has no family history of the disease, but toxic chemicals were used on her farm when she was a child. What we now call ‘conventional farming’ is actually something very new. In the 20th century, our naïve optimism about science led to the over-exuberant use of antibiotics, infant formulas, surgery, pesticides, hormones, and fossil fuels. It’s time to bring this back into balance. Organic food has long been the standard for human nutrition. In contrast, many chemicals and hormones introduced post World War II do not have proven long-term safety. Some of them may be fine. Time will tell. I prefer organic for children where there is a good choice. With the dramatic increase in organic farming in recent years, the new generation of organic farmers is developing innovative and earth friendly ways to increase yields and improve flavor. What is organic and why is it so important for our children? Pesticides In Our Food and Environment Chemicals used in conventional farming pose many risks to human health. The Environmental Protection Agency (EPA) is charged with evaluating pesticides and setting “acceptable risk” levels of exposure. EPA’s tests have largely been conducted on fully grown adult men or non-human animal species, exposing them to one chemical at a time. Evidence now shows that chemicals in combination–the way we are usually exposed to them in everyday life—may exponentially increase health risk. Additionally, many EPA-approved pesticides were registered long before extensive research linked these chemicals to cancer and other diseases. Now the EPA considers 33% of all pesticides as potentially cancer-causing. Why Organic Especially for Children? Children are developing organs to last a lifetime. Due to their smaller size, fast-growing speedy metabolisms, and less varied diets, infants and children are more vulnerable to health and developmental damage. In 1993, a congressionally mandated study by the National Academy of Sciences expressed concern that existing methods of risk evaluation for pesticide exposure were failing children. More recently, the Consumers Union and Environmental Working Group have released studies confirming that children are overexposed even if their exposure is within legal limits. The Food Quality Protection Act of 1996 mandated a review of agricultural chemicals in light of this new information about risk assessment. Included in this act is a requirement to impose a 10-fold margin of safety to protect children when setting standards for the use of pesticides on food. While safety standards have become more strict, buying organic products, if they are available and you can afford them, and supporting organic agriculture may be your best protection. Why Does Organic Cost More? Organic products do tend to cost more than their conventional counterparts. To some extent, this is changing as production capacity and demand for organic products increase, improving production efficiencies and lowering prices at the checkout. In addition, many involved in organic are striving for a sustainable agricultural system–one which is ecologically sound as well as economically viable. Paying farmers a fair price for their products is an important tenet for many involved in organic agriculture. Raising a family on a budget can pose challenges at times. Watching pennies and doing “the right thing” for our families can sometime seem in conflict. For example, in the case of organic foods and fibers, it’s understandable to question if the benefits are really worth the extra cost. Looking beyond the price of an organic product and considering the true value, may shed light on the subject. When considering products for your children, organic may indeed be a far better value. An Opportunity to Support a Healthier Tomorrow Our children are our most treasured resources, and we have the opportunity to protect them. 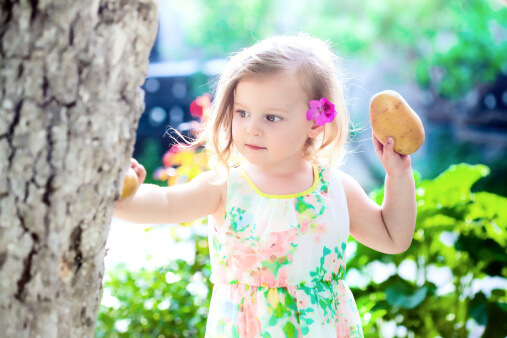 By reducing toxic exposure, organic products can help us raise healthy, strong children. Through nurturing the soil and keeping toxic and persistent chemicals out of the environment, organic agriculture is one thing we can support to help us pass along a healthy and safe planet for future generations. The cost may be a little more, but the value for you and your family may be far greater. Communities need to begin educating parents about the benefits of “Going Organic”. I only became aware of organic foods when trying to find a diet to lose 25-30 lbs in 2005. After studying 10-15 diets, I realized I didn’t want a temporary fix to lose weight and came upon Dr. Shinya’s book, “The Enzyme Factor”. I then came to a sudden realization that I wanted to change my eating habits for life…not temporarily. I have been eating organic, kosher, and natural foods as much as possible since then. I have lost 27 lbs. and my weight has constantly been within 1-5 lbs ever since going organic.